The Friends Center for Children invites families with children and the greater New Haven community to participate in the Ninth Annual Fair Haven Family Stroll and Festival. Join us for a springtime stroll along the Quinnipiac River followed by a festival in the riverside park. The day’s events include live music, family-friendly activities, arts and crafts, games, door prizes, and participation from our national, state, and local elected officials. The event’s purpose is to highlight the urgent need for high-quality early education in New Haven, connect families to local resources and organizations, and celebrate springtime in the city. The stroll and festival is a partnership of Friends Center for Children and Elm City Montessori School, and it’s made possible thanks to generous sponsorship from local businesses and foundations, including Eder Family Foundation, Friends Center for Children, GHP, NH ChILD, Patriquin Architects, The Community Foundation for Greater New Haven, Webster Bank, National Roofing, Regional Water Authority. 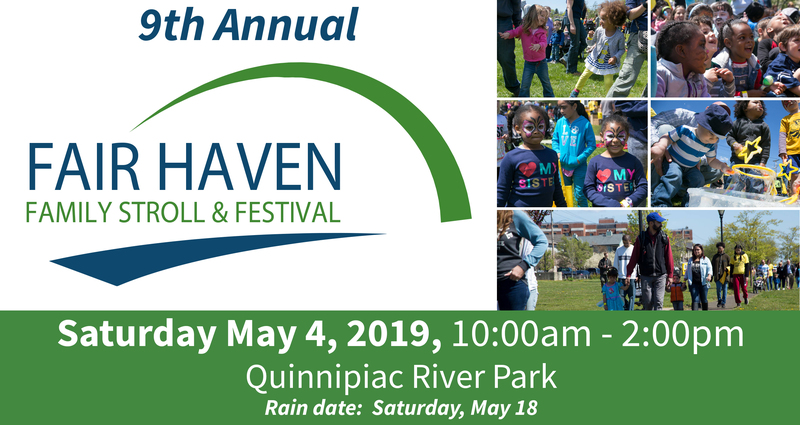 “The Fair Haven Family Stroll and Festival is a fantastic opportunity to engage our community in a conversation about quality early childhood education in this country,” said Allyx Schiavone, Executive Director of The Friends Center for Children. “We know that high-quality early education programs have a high return on investment, making it that much more important to educate our community to inspire a change nationwide.” The event has been a great success story for the Fair Haven neighborhood of New Haven. In 2018 it welcomed more than 1,000 adults and children, featured over 30 community-based organizations and service providers, and raised more than $15,000 to support early childhood education. Information Contact: Sarah Kwan, Director of Development and Communications. Founded in 2007, the Friends Center for Children is an early childhood, non-sectarian education center providing year-round, full-time care for children ages 3 months to 5 years. Its mission is to educate children, empower families, inspire teachers, engage community, and embrace diversity. The Friends Center offers a child-centered, hands-on learning experience in a safe and nurturing environment. With a values-based curriculum, children learn through creative play and a wide range of developmentally-appropriate activities. Elm City Montessori School is proud to be New Haven’s first public Montessori school, currently serving pre-K through third-grade students. Core to the Montessori approach is a focus on interactive, self-directed learning and hands-on inquiry in thoughtfully prepared multi-age classrooms that foster independence, creativity, critical thinking and leadership. Their program’s developmental approach to education integrates math, science, language arts, music, and the outdoors in a nurturing and academically rigorous environment that promotes lifelong learning and helps each child realize his or her full potential.